Fig. : Frequency of the trend change of a certain magnitude, over the period 2021-2035 compared to 2006-2020, in 100 simulations that all assume the same reduction in greenhouse-gas emissions. Recently, Prof Jochem Marotzke, managing director at the Max Planck Institute for Meteorology (MPI-M) and head of the department “The Ocean in the Earth System” published in a recent paper in WIREs that even if CO2 emissions fall after 2020, there is a one-in-three chance that global surface warming will speed up until 2035 instead of slowing down, and we cannot predict which state we will be in. This paper invites you to a thought experiment: We jump into year 2035 and look back at the climate evolution over the thirty years prior, since 2006. The Paris agreement from 2015 has been implemented very effectively, and greenhouse-gas emissions have fallen since 2020. Can we see the effects of the policy change brought about by the Paris agreement not only in the emissions but also in the climate response? Quite likely, fifteen years after a turnaround in emissions, society and the public would want to know about the effects of the policy change. But the question is eminently difficult to answer, because fifteen years is a relatively short period in climate evolution, and trends over these timescales are dominated by random natural internal variability. The climate response to a policy change toward emissions reductions is thus obscured and possibly overwhelmed by internal variability. This paper provides a new perspective on the resulting irreducible uncertainty, by analysing very large (100-member) ensembles of state-of-the-art climate-model simulations with the help of a formal theory of event causation. The simulation results suggest a one-in-three chance that even under emissions reductions after 2020, global surface warming will speed up instead of slowing down, when we compare the period 2021–2035 against the period 2006–2020. If, by contrast, the global surface warming slows down when comparing these two periods, it would be important to know whether this slowing down was indeed caused by the emissions reductions – or whether it happened by chance. A probability for such causation can be computed, by comparing the simulations that assume emissions reductions against simulations that do not; the probability comes out as one-in-three. 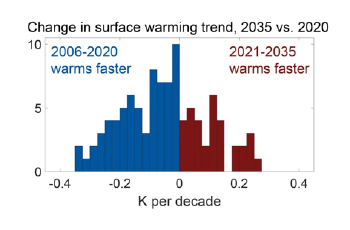 If surface warming speeds up instead of slowing down despite emissions reductions, the climate science community might face the mirror image of the debate about the surface-warming slowdown from a few years ago – there, the emissions had kept rising. By quantifying causation probabilities and the inherent irreducible uncertainty, this paper may aid both the science community and the public in preparing for a rational discourse about seemingly surprising futures.